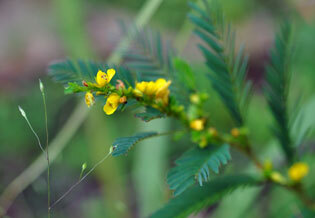 Also Called: Wild sensitive plant. Stems: Erect, slender, glabrous to minutely pubescent, usually branched; branches ascending to widely spreading. Leaves: Alternate, short-stalked, once even-pinnately compound, .8 to 2.4 inches long; leaflets 6-22 pairs, narrowly oblong, 1/4 to 3/5 inch long, 1/25 to 1/8 inch wide, usually glabrous; margins fringed; tip rounded with bristle; stipules persistent, linear-lanceolate, 1/6 to 1/3 inch long, tapering to point. Inflorescences: Solitary flower or 2-3 clustered in leaf axils. Flowers: Inconspicuous; stalk 1/12 to 1/6 inch long, minutely pubescent; sepals 5, united near base, lanceolate, 1/8 to 1/5 inch long, minutely pubescent; petals 5, yellow, unequal, 1/8 to 1/3 inch long, lowest petal twice as long as others; stamens 5, unequal; filaments very short; anthers pink to rose. Flowers tend to wilt by mid-day. Fruits: Pod, erect, straight or slightly curved, linear-oblong, .8 to 1.6 inch long, 1/8 to 1/4 inch wide, flat, minutely pubescent or smooth, mostly 5- to 10-seeded; seeds nearly square, about 1/8 inch, black, shiny. Habitat: Open rocky woods and thickets, upland slopes, prairies, roadsides, fallow fields, disturbed areas; dry sandy or rocky soils. Toxicity: The fruits and seeds may cause mild digestive tract irritation when consumed in large quantities. Forage Value: Seeds eaten by turkeys and bobwhite quail. Foliage eaten by cattle and sheep. Uses: Native Americans used the plant in a compound infusion to treat faintness and the roots were used medicinally to enhance stamina when competing in sport games. Comments: The leaflets are touch sensitive. From Latin nicto "to wink", alluding to the touch sensitive nature of the leaflets.